Throughout temperate regions of the northern hemisphere, urban forests play an important role in community recreation, wildlife conservation, and science education. The abundance and quality of urban forest habitats varies greatly across geographic regions, depending on local land-use history and development pressures. Research studies in the northeastern U.S. suggest that high-quality forest habitat—including stands of old-growth—are in some cases hiding in plain sight across city landscapes. Northeastern forests nonetheless face conservation challenges due to habitat fragmentation, invasion of exotic plants, and overuse/misuse by the general public. Because urban forests are generally spread across a complex assortment of private properties and public lands, they are sometimes poorly surveyed and rarely governed by a comprehensive management plan. Like many areas of western New York, Monroe County was colonized by European settlers at a relatively late date (1810s-1820s). Unlike comparable areas of the upper Midwest, Monroe Co. underwent no systematic clear-cutting nor the resulting catastrophic fires fueled by slash. Through its early years, Monroe County lands were primarily used for small to mid-sized family farms. Areas poorly suited for agriculture (slopes and ridges associated with kames, eskers, drumlins, kettle holes, etc.) were set aside or used as woodlots, subject to small-scale timber harvest by farmers but not converted to crop production. Influential figures like George Eastman and Frederick Olmsted valued green space, and helped to establish parklands throughout the greater Rochester region. Although there was widespread abandonment of agricultural lands after World War II, the economy of the region never heated to the point that forested lands were necessarily worth the effort to develop for commercial or residential purposes. In many cases, agricultural lands and associated woodlots were turned over to educational institutions (University of Rochester, Rochester Institute of Technology) or local townships (Brighton, Henrietta, Pittsford, etc.) and remained in a state of benign neglect. 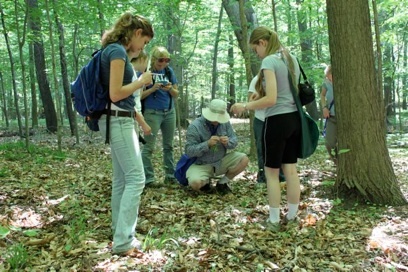 Despite its research focus on evolutionary processes, the Ramsey lab has longstanding interest in habitat conservation as well as skills in field sampling, plant identification, and vegetation analysis. 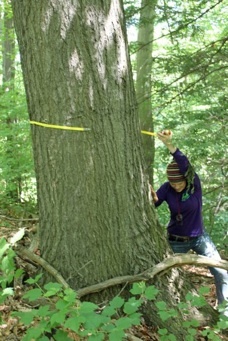 Since 2008, we have studied forest lands of Monroe Co., with three principle objects: (1) identify old-growth forest stands on public and private property, based on GIS, historical aerial photographs, and land deeds/tax records; (2) assess old-growth forest health—including canopy tree regeneration, downed dead wood, and invasion by exotic species—based on comprehensive field surveys; and (3) characterize understory community composition and its association to historical land use and edaphic factors. To date, we have surveyed old-growth stands at 24 sites across Monroe Co. in County Parks, City/Town Parks, Fish and Wildlife Management Areas, and property owned by schools and educational institutions. Forest sites range in size from ~1 to 12 hectares; where feasible, we surveyed 1950s-era second-growth stands adjoining old-growth. Tree surveys are conducted in 25 x 25 m plots and involve taxonomic identification and DBH measurements for all trees and shrubs, including saplings and seedlings ≥1 m in height. 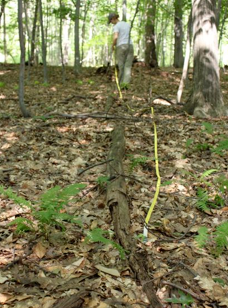 Understory surveys are conducted in 5 x 5 m plots and involve identification and percent cover estimates for all herbaceous plants, as well as tree/shrub saplings and seedlings <1 meter in height. These data address conceptual issues in the disciplines of forest ecology and forest management. Our primary goal, however, is to provide useful data to land managers and the general public. These efforts have been funded by a UR Faculty Instructional Technology grant as well as an NSF CAREER award. In the space below, we describe major findings of our work in text and graphs. 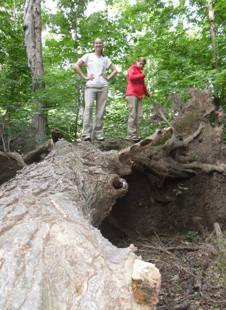 Additional photographs of forest sites and survey efforts can be found on our Photos & News page. 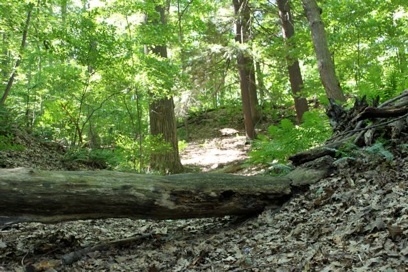 Details of our forest preservation efforts on the University of Rochester South Campus can be found on our South Campus pages. 1. Stand structure Forest structure provides critical insights into disturbance history and health, most importantly, the regeneration of canopy trees. To evaluate the structure of Rochester old-growth, we surveyed 350 tree plots across 24 sites, representing measurement of >50,000 individual trees. Site total basal areas ranges from 32.7 to 69.2 m2 per ha, with mature trees (DBH 26.0-45.9 cm) and large trees (DBH ≥46.0 cm) generally comprising ≥80% of the total. 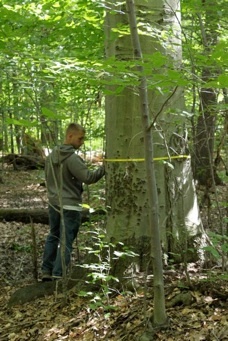 Prominent species include red oak (12.8 m2 basal area per ha), sugar maple (8.9 m2 per ha), beech (5.9 m2 per ha), red maple (3.2 m2 per ha), and hickory (2.1 m2 per ha for shagbark + bitternut). Tree densities range from ~1,200 to 5,000 stems per ha, with snags disproportionately represented in smaller size classes. Based on these data, more than three-quarters of surveyed forests have structural indices exceeding thresholds for old-growth designation. Coarse woody debris, however, is often less abundant than expected for old-growth: site volumes range from 10.4 to 89.3 m3 per ha. Low debris abundance probably reflects understory grooming by park employees and frisbee golf enthusiasts at some parks. In all old-growth sites, we found abundant seedlings and saplings of sugar maple, red maple, and beech, as would be expected for these highly shade-tolerant canopy tree species. Despite the abundance of large red oaks in the study region, seedlings and saplings are uncommon, rare, or—in some sites—completely absent from the understory. At our Braddock Bay study site, for example, sugar maple saplings and mature trees occur at densities of 1,420 and 25 stems per ha, respectively, while red oak saplings and mature trees occur at densities of 0 and 23 stems per ha. Failure of oak recruitment has been noted elsewhere in eastern North America and probably reflects forest “mesophycation” by suppression of fire and other natural disturbances. Shagbark hickory and black cherry show similar size-class distributions to red oak, suggesting broad-scale changes in community composition are now occurring in Rochester forests. 2. Community composition, biodiversity, and invasion Community composition is an important factor in prioritizing conservation efforts, as it speaks to the ecological interchangeability of sites as well as biodiversity and invadedness by exotic organisms. We investigated these issues by surveying ~350 tree plots (described above) and ~300 understory plots, the latter representing measurement of >25,000 occurrences of 86 herb and fern species. 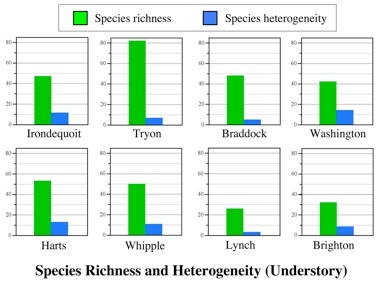 We find that canopy composition of Rochester old-growth varies substantially, from sites dominated by beech and/or sugar maple (most common in low-lying areas) to sites dominated by oak, cherry birch, and/or hickory (most common on slopes and rough terrain). 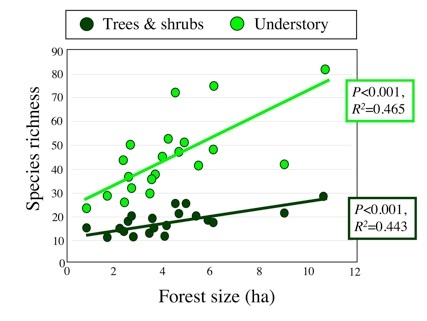 Forest understories are also highly variable. While a few wildflower species like mayapple and jack-in-the-pulpit are widely distributed, many other species occurred at one or a few sites. Total fern cover ranges from 0 to 19.6%, with sensitive fern, interrupted fern, and New York fern each being most common in one or two stands. Statistical analyses indicated that ≥98% of all possible pairwise site comparisons were significantly different. 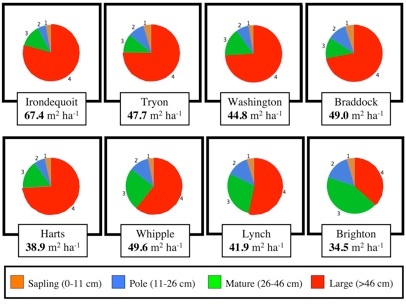 These findings illustrate the unique composition of Monroe County old-growth sites, and probably reflects edaphic/physiographic heterogeneity as well as spatial isolation of fragmented forests. Despite their proximity to gardens and other repositories of non-native species, old-growth stands harbor few exotics. Norway maple and buckthorn occur at average densities of only 46.7 and 29.1 stems per ha, respectively, while garlic mustard and honeysuckle have average covers of 0.37 and 0.31%. Richness of native species ranges from 22 to 82 per site, and was significantly correlated with stand size. Nonetheless, small stands harbor considerable plant diversity. The University of Rochester South Campus has 50 species in ~4.5 ha of old-growth, for example, while Greece-Canal Park has 74 species in ~6.0 ha of old-growth. 3. Agricultural legacy and land-use history Old-growth in Monroe Co. is often flanked by second-growth that developed on abandoned agricultural lands in the 1940s and 1950s. Second-growth areas provide habitat for shade-intolerant pioneer plants but could also be a reservoir for exotics. 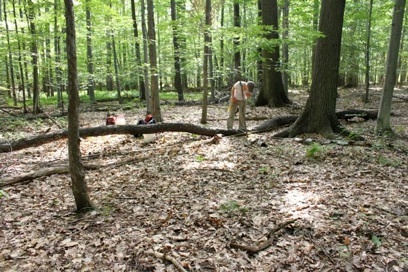 We have investigated the composition and structure of second-growth stands using 25 x 25 m tree plots, as described above, and found surprising heterogeneity—some sites are comprised exclusively of fast-growing natives (red maple, serviceberry, sassafras, spicebush, cottonwood) while other sites are heavily invaded by exotics (buckthorn, Norway maple, autumn olive, honeysuckle, bittersweet, multifloral rose). Seedlings and saplings of weakly-recruiting native canopy trees like red oak and black cherry are abundant in some second-growth areas but absent in others. Site-to-site variation in plant communities probably reflects differences in agricultural land use (crop production vs. grazing vs. orchards) as well as physical features, and the Ramsey lab is now testing statistical associations between site history, edaphic/physiographical attributes, and woody plant communities. Soils in Monroe Co. forests are coarsely textured (sandy loams, loamy sands) and acidic (pH 4.5-6.5), with slopes from 0 to ~35%. 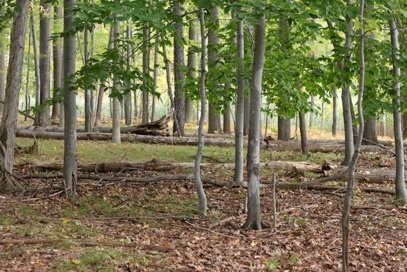 Total canopy tree basal area with contributions of so-called sapling, pole, mature, and large size classes at eight old-growth stands in Monroe Co., New York. Despite their urban locations, most of the 24 sites we surveyed exceed thresholds for old-growth designation based on forest structural indices. Down dead wood volumes for decay classes 1-5 at eight old-growth sites in Monroe Co. Abundance of coarse woody debris is in some sites less than reported from remote old-growth areas, probably due to grooming of the forest understory by park employees and frisbee golf enthusiasts. 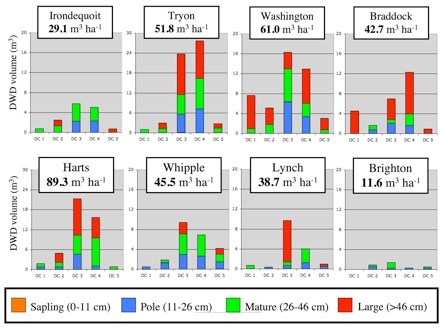 Abundance of common canopy tree species across ten old-growth sites in Monroe Co. Stand composition varies dramatically despite the close-spatial occurrence of these remnant forest areas. In general, oak dominates on dry slopes while beech dominates in soggy flatland sites. Other frequently-observed canopy species include shagbark hickory, tuliptree, red maple, and black cherry. Coniferous species are rare in our region— there are localized stands of hemlock near Lake Ontario and scattered occurrences of white pine on dry slopes. 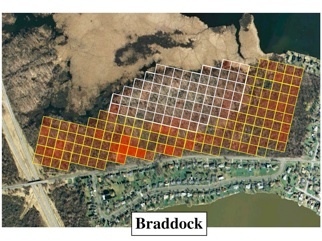 Size class distributions for maples (sugar and red combined) vs. oaks (red and white combined) at two old-growth sites (Washington Grove, upper graphs; Braddock Bay, lower graphs). Y-axes are plotted on a log-scale and represent per hectare values. In general, maples and beech exhibit excellent recruitment in Monroe Co. forests while oaks exhibit low— or in some cases, non-existent— recruitment. Black cherry and hickory species have similar size class distributions to oaks, suggesting that a fundamental change in forest composition is happening in our region. Understory plant diversity in eight old-growth stands of Monroe Co., as measured in 5 m x 5 m plots arrayed at constant density across study sites. For the latitude, Rochester old-growth has considerable botanical diversity, especially for ferns and herbaceous perennials. 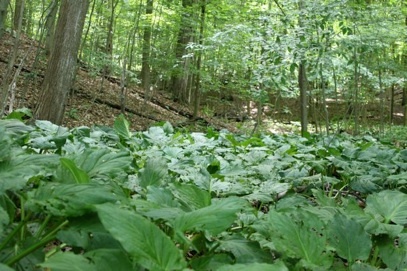 Common understory species include jack-in-the-pulpit, baneberry, trout lily, mayapple, horse nettle, spicebush, maple-leaf viburnum, white trillium, indian pipe, beechdrops, ramps, New York fern, sensitive fern, interrupted fern, as well as several sedge and grass taxa. Relationship between remnant forest size and vascular plant diversity, as determined in tree plots (25 m x 25 m) and herb plots (5 m x 5 m) arrayed at constant density across study sites (N=20 sites). For both tree/shrubs and understory vegetation, there is a clear statistical relationship between forest area and diversity. Small old-growth stands nonetheless harbor considerable species richness, including unique taxa not observed at other forest sites. 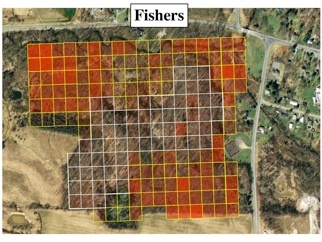 Exotic plant invasion in old-growth forest habitat (white-bordered squares) and second-growth forest habitat (yellow-bordered squares) at two Monroe County sites (Fishers Park, Braddock Bay). Boundaries of old-growth and second-growth areas were determined from historical aerial photographs (1930-present). Intensity of invasion (total cover summed across exotic species) is indicated by red shading. In general, the abundance of exotic plants is substantially higher in second-growth forest than in old-growth forest, suggesting a dramatic difference in the invasibility of the two habitats. Common Rochester-area forest invaders include oriental bittersweet, honeysuckles, multifloral rose, common buckthorn, swallow-wort, and garlic mustard. Photographs shown here were taken by J. Ramsey, T. Ramsey, A. Green, and undergraduates working on the Ramsey lab field crew. Photographs of old-growth stands across Monroe County— including Braddock Bay, Fishers Park, Irondequoit Bay, Lynch Woods, Washington Grove, and Whipple Woods— that show forest understory, stature of large trees, canopy tree population structure, and coarse woody debris. Photos were taken June-September in 2010 and 2011. Locations of old-growth stands in Monroe Co., NY, that have been studied by the Ramsey lab. Stands vary in size from ~1 to 12 hectares and occur across a range of topographic conditions and proximities to Lake Ontario, which has a moderating effect on the climate of the Rochester area. Like lake plain regions of Ohio, Illinois, and Michigan, the forests of Rochester are generally classified as “beech-maple.” Canopy composition is locally variable, however, and some sites have more oak and hickory than beech and maple.